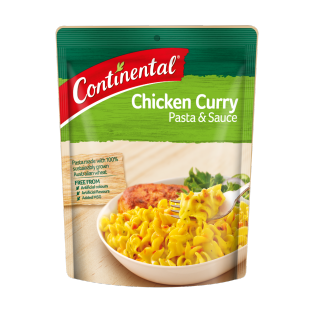 Continental's Indian twist on the classic chicken curry pasta and sauce recipe, is fast and simple to make. Learn how to make this flavoursome dish today. Allergens:Contains wheat products and sulphites. Blended on equipment that also processes products containing milk, soybean, peanut, sesame, egg, fish and crustacea. Cooking time: 10 minutes Stove top - for best results 1. Bring ¾ cup (190mL) Lite milk, 1 cup (250mL) hot water, 2 teaspoons Flora Salt Reduced and Pasta & Sauce to the boil, stirring. 2. Simmer, uncovered for 10 minutes, stirring regularly until sauce thickens and pasta is cooked. Microwave (900W) – cooking times may vary. 1. Combine ¾ cup (190mL) Lite milk, 1 cup (250mL) hot water, 2 teaspoons Flora Salt Reduced and Pasta & Sauce in a microwave safe bowl. 2. Cook uncovered on HIGH for 10-12 minutes, stirring 2-3 times. Stand 2 minutes before serving. Cook a complete meal in 15 minutes. Go to our website for delicious one pan meal ideas. I love this chicken curry PaSta. YummY on its Own, or as a side dish. Quck and Easy to make! Got the four pack 'snack' size, way too small even for a snack, what self respecting company calls that much a snack? Just a scam. Overall alright taste, though, good for overnight hikes on a Trangia. My partner and son love this chicken curry pasta but for the last few months it has been so hot my 6yr so can't eat it. And my partner is complaining as well. Hi this chicken curry pasta pack is my Favourite, we have it aLot, however toniGht i cooked it and it is Very sPicy & peppery, way stronger than ive ever had.Have you changed the ingredients or is There a mistake? I sTill have the packet. Thanks for letting us know, Claire. Are you able to give us a call at 1800 888 997 quoting reference 23251412? We'd like to get the best before dates from the pack & make it up to you. Love this pasta. One of my favourites but like the last reveiw siaid the packet i ate today seemed to be really peppery and spicy. Almost unable to eat it. I dont have the packet anymore though. Hi, sorry to hear that your last 2 packs of Chicken Curry Pasta & Sauce were too spicy. If you still have the packs with you, could you please give us a call at 1800 888 997 quoting reference 20005186? Thanks & we look forward to your call.